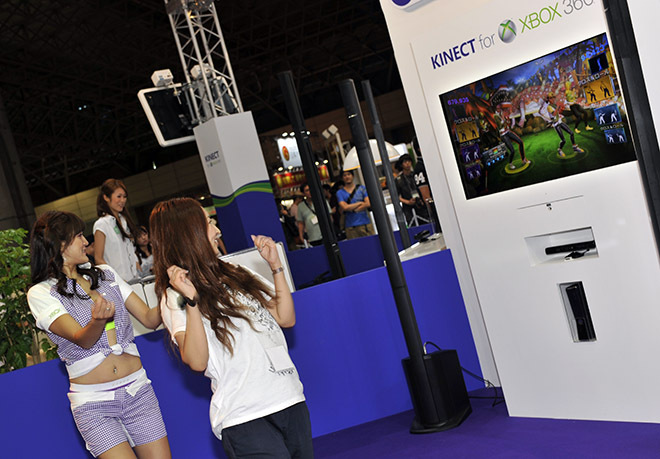 Midori Kaneko, right, enjoys a game of Dance Central 2 for Kinect at the Microsoft booth at Tokyo Game Show on Friday. But she says she won't buy an Xbox. TOKYO — Of all the Tokyo Game Show attendees who visited the Kinect booth, one salaryman in a button-down shirt stood out. He jumped into the Dance Central game with gusto, busting out crazy moves in his patent-leather shoes, literally going leaps and bounds beyond what the dance game required. A small crowd gathered to watch his moves. At one point, he did a handstand in front of the Xbox 360 camera controller. He was making Kinect look like barrels of fun. But did the man, who gave his name as Yoshida, plan to buy the upcoming game and do “The Humpty Dance” at home? A few months from now, Microsoft will celebrate its 10th anniversary of not being able to sell very many videogames in Japan. While the company is enjoying record-high sales in the United States and Europe with its redesigned Xbox 360 and the Kinect motion controller, it remains locked in a struggle to make its console appealing to one of the world’s biggest markets for gaming. Aside from an Xbox 360 roster filled with the kind of shooting games that historically don’t do so well in Japan, the biggest thing holding back Kinect might be a simple issue of real estate: The unique sensor, which lets players use their bodies to control the on-screen action, requires a lot of physical space to operate — and that’s something a lot of Japanese people just don’t have. Microsoft has had no luck in Japan ever since it launched the original Xbox there in February 2002. It was the exact opposite of what the country wanted out of a game machine — a giant, noisy, power-sucking box with a massive controller and nothing but Western games, like first-person shooters, that were unpopular with gamers here. The marketing, the design, the content — everything was out of whack with what Japan wanted. Everything about the original Xbox was out of whack with what Japanese gamers wanted. On paper, few of those things apply to Xbox 360, which is probably why it has sold three times as much as the first Xbox. But even these sales numbers are relatively tiny. Since its launch in 2005, Xbox 360 has only sold a pitiful 1.5 million units in Japan compared to PlayStation 3’s 6.7 million and Wii’s 11 million. In fact, sales of the console in Japan linger barely above those of the ancient PlayStation 2. Kinect doesn’t seem to be helping the problem. The controller, with its camera and microphone sensors, “doesn’t fit with Japanese culture,” a player named Takizawa told Wired.com at the Microsoft booth. He thought Michael Jackson: The Experience looked like a lot of fun, but questioned whether he’d have room to play it in his typically small living space. Another gamer named Takumi, who is a student at Kanagawa Institute of Technology, said he could probably get a Kinect into his place, although his friend Akira said “no way.” Both of them are PlayStation 3 owners, but neither owns an Xbox. “It’s too expensive,” said Takumi. A Kinect alone costs 15,000 yen. The ironic thing about Microsoft’s struggles to sell Kinect to an apathetic Japanese audience is that the company says Japan’s gamemakers are coming up with the best concepts for the motion controller. Two of the Microsoft-funded games are on display at the booth: Masaya Matsuura, the popular creator of the megahit PlayStation game Parappa the Rapper , is making a first-person haunted-house adventure. Suda 51, creator of ultraviolent action games like Shadows of the Damned , is contributing Demonic Pitch , in which you play a baseball player that fights monsters with his killer fastballs. These are clever, original games from talented designers. But Microsoft has been down this road before, commissioning the original creators of Japan’s popular RPGs to make Xbox-exclusive games. The strategy didn’t work. Eventually the company successfully lobbied Square Enix to release Final Fantasy XIII on Xbox 360 as well as PlayStation 3. The incredibly popular series barely moved the needle. Sometimes it seems like it doesn’t matter what Microsoft creates — Japan’s gamers just aren’t that into Xbox games.